Virginia football entered its 2017 matchup with the Indiana Hoosiers keying on Indiana pro-style quarterback and then starter Richard Lagow. The Cavalier defense accomplished its goal, stifling Lagow to only 3 completions in 10 attempts for 24 yards and an interception in over one quarter of action. An A.J. Mejia 22-yard field goal put the Hoos on top 3-0 in the second quarter, and on the very next possession Indiana inserted redshirt freshman Peyton Ramsey. Ramsey marched the Hoosier offense down the field on six plays, scoring the game’s first touchdown on a 29-yard touchdown pass to wide receiver Simmie Cobbs. Ramsey, who is a threat as a runner and passer, rushed 26 yards for a score on Indiana’s next offensive drive. The Hoosiers stayed with him the rest of the game and he ultimately led his team to a 34-17 victory over the homestanding Cavaliers. Ramsey was outstanding, completing 16-of-20 passes for 173 yards and two touchdowns. He added 32 yards rushing and a score. Needless to say, the Virginia defense will be well aware of Ramsey’s abilities heading into this Saturday’s matchup in Bloomington. The 6’2”, 210-pound redshirt sophomore began the 2018 season in positive fashion, completing 20-of-27 passes for 156 yards with 3 touchdowns and 1 interception in a 38-28 road win over Florida International. He added 8 carries for 36 yards in the victory. Indiana enters the Virginia game without its top two running backs, Morgan Ellison (suspension) and Cole Gest (injury). However, true freshman Stevie Scott managed 70 yards on 20 carries against FIU, and this is an experienced Indiana offensive line group led by left tackle Coy Cronk (Jr, 26 starts), left guard (Wes Martin (Sr, 26 starts), center Hunter Littlejohn (Jr, 13 starts), right guard Simon Stepaniak (Jr, 9 starts) and right tackle Brandon Knight (Sr, 15 starts). Defensively, Indiana surrendered 170 yards rushing (4.4 yards per carry) and three rushing touchdowns in its season opener. This number is slightly up from the 160 yards rushing the team has yielded per game the previous two seasons. The Hoosiers only had one sack but forced three turnovers (including an interception return for a touchdown). Passing-wise, FIU completed 17-of-28 passes for only 157 yards with one touchdown and one interception. With talented players returning on the defensive line and in the secondary, passing against IU could prove difficult. Meanwhile, Virginia is coming off one of its best rushing performances in years. 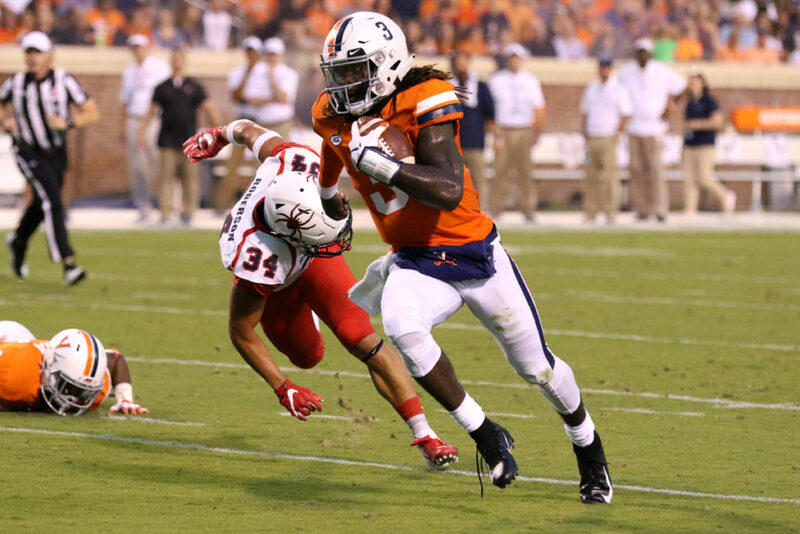 Led by ACC Running Back of the Week Jordan Ellis and UVA’s new dual-threat quarterback, Bryce Perkins, the Hoos churned out 333 yards on the ground in the season opener against Richmond. Virginia’s defense, led by an experienced and talented secondary, shut down the Spiders offense and forced two interceptions as the Hoos won, 42-13. While the Hoos didn’t get a lot of respect in terms of preseason voting, this team seems to have a confidence about it. Virginia avenged a 2016 home loss to Richmond back this past Saturday. Will the Cavaliers avenge last year’s home defeat to Indiana this weekend? We’ll find out at 7:30 p.m. Saturday evening. Game Time: Saturday, Sept. 8, 7:30 p.m.
1. Can Virginia’s rushing attack become consistent and reliable? Piling up 301 yards on the ground on a weekly basis could be difficult to accomplish; however, the rushing game needs to be consistently good for the Virginia offense to succeed. Perkins, Ellis and company know how to run the ball. The key here will be the play of the offensive line, which blocked well against the Spiders but must continue to develop into a dominant group for the run-game to thrive. 2. How good of a passer is Bryce Perkins? The 6’3”, 215-pound quarterback had a decent day passing against Richmond. His line: 13-of-24, 185 yards, 2 touchdowns, 1 interception (which was returned for a touchdown). Aside from the interception and perhaps a few other plays, I thought Perkins’ decision-making was solid. He did make a few very high-quality throws and showed nice poise as the game wore on, especially with how he came back from the interception. However, most of his completions were on short routes, and we have yet to see him complete a deep ball in a live game setting. Knowing his ability as a runner, look for teams to stack the box to try and force him to pass. He’ll have to produce in the passing game to keep defenses honest, and Indiana has a quality secondary that will test him. 3. Will Virginia find an answer for field goals? After a horrid performance from kickers in 2016, A.J. Mejia played solidly in 2017, making 8-of-12. Eight field goals made in 12 attempts is a respectable number; however, all of his attempts came from under 40 yards. His only attempt last weekend against Richmond was from 35 yards, which he missed, not exactly a confidence-building performance. Mendenhall said earlier this week that he wasn’t worried about the position, but he isn’t settled, either. Bottom-line is Virginia needs to find a consistent kicker with range, whether the staff implements two kickers (one for inside 40, one for outside 40) or one. Ramsey looked unstoppable at times against Virginia last season. It’ll be interesting what happens now that Virginia knows what’s coming. Indiana’s top wide receiver from last year, Simmie Cobbs, is gone. However, the Hoosiers welcome back redshirt junior receiver Nick Westbrook, who suffered a torn ACL in the 2017 season-opener against Ohio State and missed the rest of the season. The 6’3”, 215-pound Florida native had 54 catches for 995 yards and six scores in 2016, earning honorable mention All-Big 10 honors for his performance. He only had five catches for 33 yards against FIU, but he is certainly a receiver to keep an eye on. Another player who caught my attention is Donavan Hale, a wide receiver who burned Virginia for a 32-yard touchdown reception last season and hauled in 60 yards receiving and two touchdowns (18, 2) against Florida International. All three mentioned touchdowns came with Ramsey as quarterback. He started the first two games last season but was injured in game three and sidelined for the season. The 2016 and 2017 honorable mention All-Big 10 safety will be making his 40th career start when Indiana hosts Virginia. The 6’2”, 196-pound senior has 9 career interceptions, including one he returned 33 yards for a touchdown last week. The talented DB also had a forced fumble against FIU, making it the fifth time in his career he has had a multi-turnover game. He’ll be one to watch, especially in passing situations. All four of Indiana’s touchdowns versus Virginia last season came on plays of more than 20 yards. Ramsey had touchdown passes of 32 and 29 yards, a 26-yard touchdown run, and J-Shun Harris returned a punt 44 yards for the game’s final score. UVA surrendered three plays of 20 or more yards against Richmond last week, including a 54-yard reception, a 29-yard reception, and a 21-yard reception. Big plays hurt Virginia mightily against IU last season. Despite the three long receptions last weekend, Virginia’s secondary was extremely tough in the season opener. They’ll have to be again and limit Indiana’s big plays to be in a winning position. 2. New heroes for Indiana. For all intents and purposes, Ramsey came out of nowhere to spark Indiana last season in Charlottesville. His only previous outing came in IU’s 2017 season opening loss to Ohio State, a game in which he finished 2-of-3 for 6 yards passing and had three carries for 10 yards. Who are some relatively unknown names Virginia should watch out for this year? For starters, how about Indiana’s backup quarterback? Behind Ramsey is true freshman signal caller Michael Penix, Jr., who was 8-of-10 for 96 yards and a touchdown against FIU. He also rushed two times for 8 yards. Two-way player Reese Taylor, who had three carries for 40 yards and two catches for 12 yards last week, is an exciting player capable of making big plays. The aforementioned Stevie Scott figures to be Indiana’s featured back and will need to be contained, but Taylor busted out for a 32-yard run last week. Last season’s matchup between the Indiana and Virginia special teams was lopsided in favor of the Hoosiers. IU – 7 punts, 43.4 YPP, pinned UVA inside the 20 four times. Haydon Whitehead is back as the team’s punter this season. UVA – 9 punts, 38.6 YPP, pinned IU inside the 20 twice. Lester Coleman went on to have an outstanding 2017 campaign. As mentioned earlier, the Richmond game was not his best performance. Neither was last season’s effort against IU. IU had five punt returns for 109 yards and a touchdown. J-Shun Harris is back this season. He had one return for six yards against FIU. Meanwhile, Virginia had two punt returns for 20 yards against IU last season and didn’t do much of anything in the 2018 opener against Richmond. Indiana returned two kickoffs for 54 yards, while Virginia managed only 37 yards on three kickoff return opportunities a year ago. Mejia had a good outing against Indiana last year, making his only field goal attempt (22 yards) and both extra points. Indiana’s outstanding placekicker, Griffin Oakes, connected on field goals of 51 and 48 yards. Field goals aside, Virginia was outplayed significantly on special teams last season. That cannot continue if the Hoos want a victory in Bloomington. Virginia football last traveled to Bloomington? Thanks to a Perry Jones rushing touchdown, an outstanding defensive play by Cam Johnson and a field goal by Robert Randolph as time expired, the Hoos scored 11 points in the final two minutes to capture a 34-31 win over the Hoosiers. The win, which came during the 2011 season, boosted UVA to a 2-0 record. Virginia would finish with an 8-5 season that included a 4-3 conference record and an appearance in the Chick-Fil-A Bowl against Auburn.